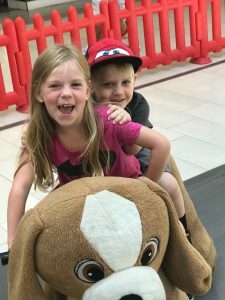 For her 7th birthday last month, Jackie Sidel decided to fundraise for Food Allergy Canada (through EchoAge) as a way to support her younger brother, Eli, who has multiple food allergies. Jackie Sidel (7) at her birthday party. Jackie understands the impact of managing food allergies on a daily basis. As a protective older sister of her 4-year-old brother, she’s always making sure that his food is safe and ensuring her parents have checked and re-checked ingredients lists. 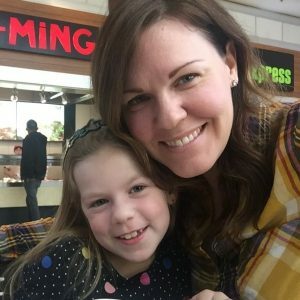 We spoke to Jackie’s mom, Johanna, about her daughter’s initiative and how food allergy affects their family. What prompted Jackie to choose Food Allergy Canada as her charity of choice? It’s important to our family that we teach our children to give back to the community and about social responsibility. 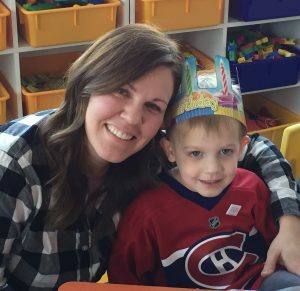 When we proposed to Jackie to choose among a short list of charities for her birthday, she immediately chose Food Allergy Canada before we finished the list. Jackie is very aware of how food allergy impacts our family and is very proactive about ensuring that there are always snacks available that are safe, not only for her younger brother, but also for her friends, one of which has Celiac disease. Before her birthday party, Jackie made sure that the food served was safe for Eli and that there would be a safe treat for her friend, as she wouldn’t be able to eat the birthday cake. Family and friends thought this was a great idea. They really liked the fact that Jackie would get a gift, a pair of inline skates, protective gear and a skateboard, as well as donate to a charity. In the past, we have asked guests to donate to charity in lieu of gifts but guests really like the birthday girl to receive a gift too, so EchoAge was a perfect option. How does Jackie support her brother, and how does she help him manage his food allergies? Jackie is our first born and she had a milk allergy as an infant which she outgrew at about 2- years-old so she really doesn’t remember how it affected her. Her experience with managing allergies comes from watching our family manage Eli’s multiple allergies. When Eli was an infant we learned that he was allergic to peanuts, tree nuts, fish, sesame, and egg. He was also allergic to soy and dairy which he has since outgrown. Jackie sees us reading all food labels, more than once, to ensure that foods are safe and that we limit eating out to a few restaurants that we consider safe. She has also forgone a few snacks she sees her friends eat because they are not safe for Eli. On more than one occasion when there have been unsafe snacks, I’ve heard her tell Eli “Let’s go find something safe to eat” and will then choose to have an alternative snack with him. 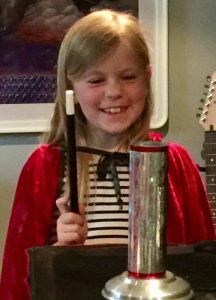 She chose Food Allergy Canada as her charity because she hopes to live in a future where Eli and our family will not have to check every single food label each time we eat a food and, in her words, “I really miss peanut butter”. We are very proud of Jackie, first for being open to the idea of donating a portion of her gift to a notable charity and second, for choosing something that affects our daily lives. She realizes that she can have a positive impact and change the future. Without knowing it, Jackie has started a trend for our family. May will always be her birthday but it has become the month where we choose to advocate awareness for food allergies moving forward. Thank you Johanna, Jackie and the Sidel Family for your support! This is a great reminder that you can make an impact and inspire others, no matter how old you are! Learn how you can support Food Allergy Canada through EchoAge!